Well, then… It’s been a hot minute! And by hot minute, I mean a new year full of influenza, ear infections, bronchitis and fevers! I’m definitely glad that January is coming to an end and maybe spring is even possibly in sight? I’m also glad to be somewhat back into the swing of things and normalcy. 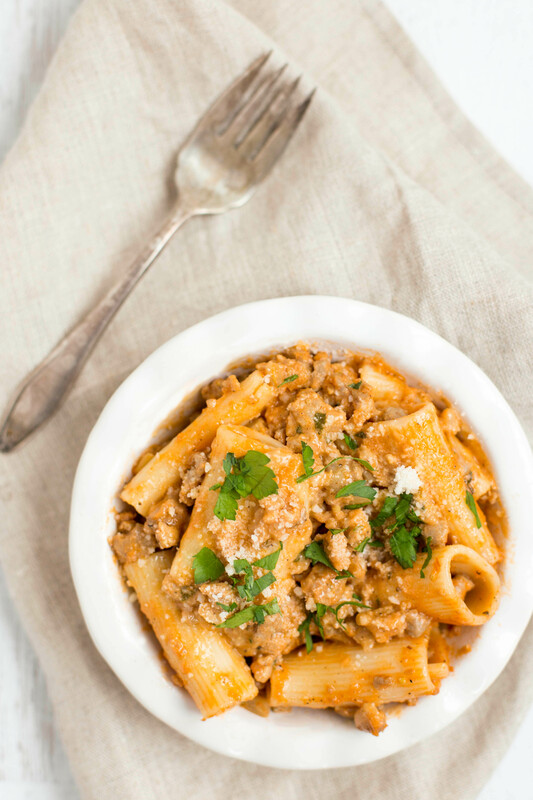 And that means I have a new recipe to share with you – Rigatoni with Sausage! 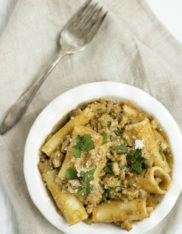 This Rigatoni with Sausage is an Ina Garten recipe that I tweaked a bit. Bob saw it on the cover of Food Network Magazine this month and immediately asked for it to make its way into our dinner lineup. It’s pretty hard to go wrong with a Barefoot Contessa recipe and this one does not disappoint. It’s rich, full of flavor and so satisfying. What is it about rich pasta dishes that go so well with winter? Probably being able to hide under layers of clothes afterwards.  Actually, I made this with a big green salad and you really don’t even need to eat much of it for it to hit the spot. If you’re looking for a hearty, cozy meal to make this winter, you should put this Rigatoni with Sausage on your to-do list. It’s ok to be bad once in awhile.  Happy weekend and stay healthy everyone! Heat the olive oil in a large Dutch oven (like Le Creuset) or a heavy pot. Add the fennel and onion and sauté for about 7 minutes, stirring frequently until everything is translucent and tender. Add in the sausage and cook for an additional 7 or 8 minutes, breaking it up with the back of your spoon until it is nicely browned small pieces. Add in the garlic, fennel seeds, red pepper flakes and salt and pepper - cook for another minute or so. Pour in the white wine, bring to a boil and add in the heavy cream, half-and-half and tomato paste. Bring back to a boil and then lower the heat and simmer for 20 minutes, until the sauce has thickened. While the sauce is simmering, cook the rigatoni in a pot of salted water. Drain the pasta and add it to the sauce, stirring to coat the pasta. Cook over low heat for 5 minutes, allowing the pasta to absorb the sauce. Turn off the heat and add in 1/2 cup of parmesan and fresh parsley. If you're serving immediately, serve it in shallow bowls and top with the remaining cheese. If you want to make this ahead, put the pasta into individual gratin dishes or one large casserole dish and top with the remaining parmesan. You can refrigerate for up to a day and when you're ready bake for 20-30 minutes at 375°F.